Timekiwi is a new service that allows you to group your publications in the same place from a few web services. This service will displays your content in the form of a timeline. 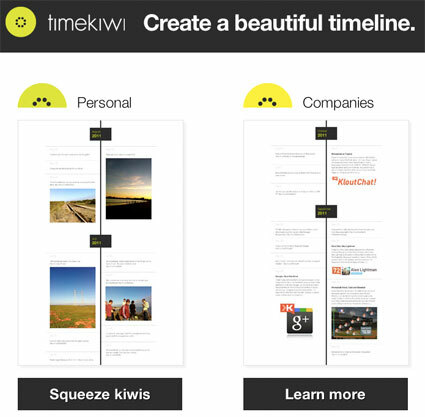 With timekiwi you can create a beautiful timeline of your twitter, blogs & photos. Sometimes it’s not enough to just work hard, but also present your work in a meaningful way. A timeline of consistent effort towards a certain goal can project perseverence, focus and determination. For now, only Twitter, Tumbler, Posterous, and instagam or your WordPress.com blog can be integrated in it’s timeline. No registration is required to use it. In fact, if you wish, you can create your own timeline of your favorite blogs. I have created my own timeline with timekiwi here, have a look and try to create your own timeline too. How to Know if a Website Uses WordPress?